This is one of the books that my darling mother sent us with the balikbayan box and my son absolutely loves it when I read this to him. 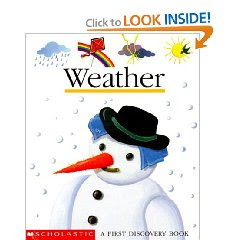 Of course, it's the SNOWMAN book for him. I especially love it because it has these transparencies pages. Whenever I'm reading it though, I really can't help but wonder how I can make it more relevant for him. You see, I grew up reading American textbooks and had always wanted to see seasons changing and the like. Unfortunately, I have yet to see autumn and I have yet to see snow. I have yet to enjoy outdoor fireplaces and go sugaring. So yeah, sometimes I feel a little sad that my son might end up like me. Then again, not everyone will travel the world for real, and I have always been thankful for reading because I got to be in different places and time. Well, son, Mommy will do her best to give you the world but if she can't, I hope I raise you well enough to go get it for yourself.